“FRFR” is the abbreviation for “full range flat response” and is called “linear frequency response over the entire frequency range”. When an amplifier or box is marked with “FRFR”, it is expressed that these have the ability to reproduce the entire frequency range aloud and thus not to falsify the sound. This is also the reference that sound engineers use when mixing and mastering on their studio monitors. The human sound range is between 40 and 15,000 Hz. The basic notes of a normal electric guitar (22 frets and standard tuning) are between 82 and 1,175 Hz, a 7-string guitar even starts at 62 Hz. These basic tones have overtones (multiples of the fundamental tones) which go up to 8,000 Hz with an electric guitar. 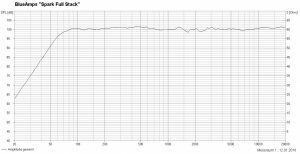 When it comes to the “total frequency range” of an electric guitar, we are talking about a range of at least 82 to 8,000 Hz, which should be reproduced linearly in “FRFR”. For an acoustic guitar that produces much more harmonics than an electric guitar, the frequency range is between 82 and 15,000 Hz. Usually the simulations of the guitar speakers on all these devices can be switched off. For this case you have to use “modelers” with guitar amps and boxes. The drawback: You only have just one cab sound and you don´t use the versatility of “modelers”, which provide quite a lot of different cab simulations. All these digital imagery refer to a reference: Linear frequency response. So if you play with cab simulation from the modeler, the connected amplification should be able to reproduce the applied signal unadulterated. And this is only possible with “FRFR”. “FRFR” does not equal “FRFR”? The term “FRFR” is unfortunately not standardized. If someone puts a “FRFR sign” onto his cabinet, it does not necessarily mean that the entire frequency range is covered. Furthermore, the reader does not know how large the deviations from the ideal linearity are. Some products of some manufacturers have some weaknesses which can be heard very clearly, thus distorting the sound. The only thing that helps to clarify itself is a look at the diagram of the frequency response of the respective amplification.